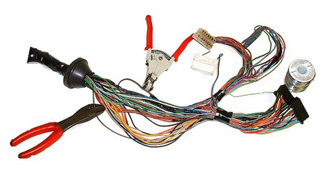 Speed Scene Wiring offers a fuel injection wire harness repair service, the cost of the repair is based on the time it takes to repair the wire harness terminals, seals, connectors and harness covering needed for the repair. A schematic fee may also be added on some wire harness repairs. We have restored LS1 and LS2 wiring systems the have been cut, missing circuits, improperly wired circuits, intentionally cut circuits to 100% operation. If you are in question on hi resistance, terminals or connectors not locking properly, please call or email for price quote, we will fix it right the first time. All wire harness repairs are rated on a level system of severity, for every wire harness repair. Examples are: level 1, level 2, level 3, Level 4 and level 5. Prices range from $532.15 to $2790.50 depending on the level of repair on the wiring system and ECM program. In all cases, we will need to see the wiring system, in house, in-order to quote you a price. Shipping is not included on any of the listed ballpark prices but typically trends at $32.00 to $69.00 per shipment. Contact us for harness repair.